The U.S. dollar has sold off significantly against the Japanese Yen over the past 2 trading days. It is nearing a very important support level. If it breaks that level, we could see a test and potential break of 95. Given that equities are pressuring USD/JPY lower, a “break” of the 95 level would be contingent upon a top in equities. 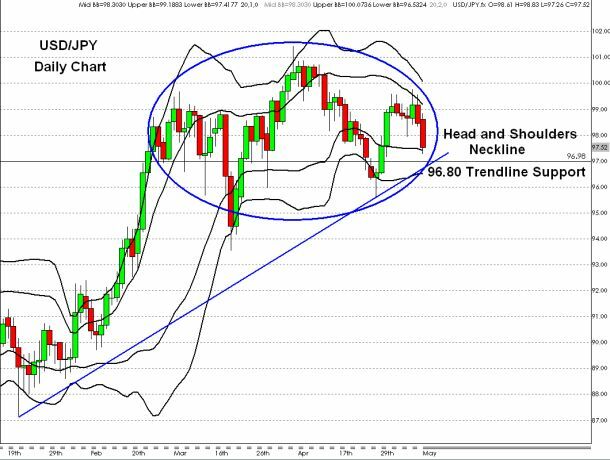 In my special report on FX360, I talk about the fundamental reasons behind the sell-off in USD/JPY. On a technical basis, the chart below illustrates how USD/JPY is approaching very critical levels. We have a major head and shoulders pattern in place, the currency pair is attempting to enter the sell zone according to our Bollinger Bands and is approaching trend line support. For those of you that like Ichimoku clouds, it has also entered the cloud. Therefore a close below 96.80 would open the door for a significant slide.